Description: Eggs laid singly on new and unfurling leaves in spring to autumn. Eggs are pale white-blue, small (about 0.5mm in diameter) and disk shaped. Immatures: Caterpillars are green when they hatch and become brown to dark brown as they grow larger. They typically feed on young, soft leaves and hide under the leaves and in the crown. They are nocturnal. Larvae mainly attack Cycas spp. and occasionally Lepidozamia sp. Larvae are oval shaped with mouthparts and legs concealed from above; they do not look like typical caterpillars. Adult: Butterflies have pale brown wings with a metallic blue or purple hue on the upper surface. The lower surface is light brown with white lines. The posterior margins of hindwings have orange and black eye patterns and a small ‘tail’. 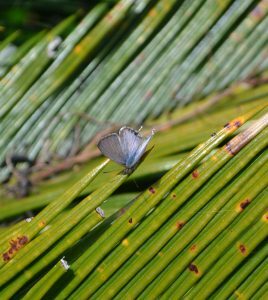 They are small to medium sized butterflies with a wingspan of about 25-30mm. Damage: Larval feeding defoliates young leaves before they elongate and mature. As a result, when defoliated leaves finally elongate and mature they can appear ragged, tattered and unsightly. Damaged leaves that are not completely consumed dry out and die, giving a burnt appearance. Controls need to be applied when new growth begins to unfold.